The entire Nellis Range, possibly including Area 51, comes up for renewal before Congress at the end of the century. This means you'll be seeing a kinder, gentler Air Force here for the next few years. Already, the environmental evaluation process has begun, and Nellis has been soliciting local input though a series of "neighborhood dialogues." Naturally, Psychospy was on the front lines, collecting free Air Force patches and posters, hobnobbing with the colonels and joining a remarkably complete tour of Nellis AFB. These folks were so pleasant and made us feel so patriotic that we are beginning to wonder, Whose side are we on? See Nellis Range for latest news. Nellis Range Renewal -- Why Bother? The Nellis Range, which now includes Freedom Ridge/White Sides, the Groom Mountains and possibly Area 51 itself, occupies withdrawn public land that must be periodically renewed by Congress. The current lease expires in November 2001, and Nellis has already begun the required environmental evaluation process. This involves holding public hearings and preparing massive reports in a project lasting through the end of the century. Most citizens might consider it dull, dull, dull, but we're having a blast. 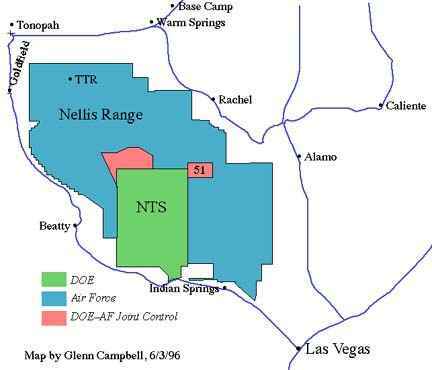 The pending range renewal means that the Nellis brass is being especially solicitous and is treading with care knowing that volatile issues are involved. In essence, this is the Freedom Ridge withdrawal process all over again, but it's much more than that because the Groom base and other secret facilities on the range could be up for renewal, too. Now's the chance to ask embarrassing environmental questions like, What are the effects of flying saucer propulsion systems on the habitat of the desert tortoise? and In which ecosystem have you buried all those missing children? We won't get any direct answers, of course, but the political process is valuable in itself and often yields unexpected rewards. UFO and conspiracy buffs may ask, if the Air Force is going to stonewall on the secrets of the Nellis Range, what is the point in participating? What does the Nellis Range Renewal have to do with cracking the mystery? Here at the Research Center, we operate on the assumption that It's all true! Everything you see on the X-Files is exactly like Mulder says it is, while Scully is a stuck-up bore who wouldn't believe in Bigfoot if she married him. Proceeding from Mulder's assumptions, however, we take a different tack than both he and the majority of the UFO community. We're not actively searching for the "key" that will unlock the UFO mystery. We assume, instead, that some part of the U.S. government already has the key. No one is better equipped to track unusual objects in the sky than the Air Force, and if they are not interested in them, it may mean they have already solved the mystery. Once you say that the government knows more than its telling, then the mystery becomes a human one. We no longer have to be concerned with reading the minds of aliens--a difficult task indeed--but only with figuring out the motivations of the people who hold the secret. If they are human then they are not entirely without honor. They have to know that the secret cannot be kept forever, especially in the post-Cold War world where hiding places are dwindling. They probably recognize that their ultimate duty is to make the secret known and in such a way that it causes the least disruption to humanity. The secret wants to get out; it just needs a path to follow. Releasing the key means negotiating with others and finding ways to help conflicting parties work toward the goals they can all agree on. Thus, we do not shrink from any human political process connected to our areas of interest. We've lost many battles so far, including the Freedom Ridge withdrawal, the Campbell obstruction case, our confiscated film, the kidnapped trespassers, the Sheriff's election and the E.T. Highway. If we oppose the Nellis Range renewal, we will lose that battle, too. What we gain, however, could be more important in the long run. For example, the battle for Freedom Ridge turned Area 51 into America's Least Secret Base. Ultimately, this resulted in far more political pressure on the Air Force than any watchers on the hill. Although we may lose the surface conflict in every one of our political fights, we are still bringing attention to the issues we think are important and may be subtly rearranging the whole battlefield in our favor. The UFO community, composed largely of zealots, escapists, mystics and con men, has never represented a credible political force. For the most part it has just been a bunch of loons fighting amongst themselves. Everyone demands the truth, but few are willing to go through the disciplined, step-by-step process of assembling it. To get to our final destination, we may have to follow a slow, indirect path that seems uninteresting. If we take the position that the government knows more about UFOs than it is telling and ought to come clean, then this translates into a political position we must take in all our earthly affairs. We need to fight for less secrecy and greater government accountability even if there are no aliens in sight. We also need to uphold the rule of law and the principals of good government. When people's emotions carry them away, as usually happens wherever UFOs are mentioned, they need to hold fast to our earthly laws and ethics to avoid descending into chaos. Expand our understanding of Nellis and its operations. Establish alliances and relationships, both with our allies and opponents. Build a public record that might be used in future legal and political actions. Draw public attention to the issues that concern us. Assure that the law is obeyed. Learn more about political and governmental processes. Collect from the Air Force as many free posters, photos, patches, tours, lunches, refreshments and other stuff as possible before they stop being nice. Both the Nevada Test Site and the Nellis are currently preparing their environmental reports, which involve public hearings and huge documents suitable as doorstops. Both NTS and Nellis contain various places you can't get to from here, like Area 51, Papoose Lake and several other off-limits areas we have our eye on. The Nevada Test Site has produced a massive, 8-volume Draft Environmental Impact Statement* (EIS), which is a must-read for any Restricted Area snoop. You can get a free copy while supplies last by calling (800)405-1140. The Dept. of Energy is trying to define the post-Cold War role for the NTS, since it seems highly unlikely that nuclear weapons will ever again be tested there. The environmental review of four alternatives is well under way, and the hearing and comment period has already ended. We assume there is a Memorandum of Understanding between DOE and the Air Force establishing Air Force control of Area 51, and since it is not cited in the EIS, it must be secret. It is probably similar to the one which gave DOE control of Air Force land in the Pahute Mesa area. (Indeed, a map on page 3-12 of Volume 1 shows similar boundary lines for both the Pahute Mesa perimeter and the line between NTS and Area 51.) The Memorandum of Understanding clouds the issue of whose EIS Area 51 ought to appear on: NTS, Nellis or a third "stealth" EIS specifically for Area 51. In any case, any sections on Area 51 are likely to be secret and we will learn about them only by inference. Such a secret arrangement between DOE and the Air Force might be getting increasingly awkward, and DOE probably isn't happy about it. We wonder if circumstances might eventually force the Air Force to officially take control of Area 51. Here is the text of Public Land Order 1662. On May 28, we filed a FOIA request to DOE for any document delegating control of Area 51 to the Air Force. We expect a denial, of course, but the grounds for denial are important. 6/17/96: The denial has arrived: "This office can neither confirm nor deny the existence of any documents responsive to your request." In other words, control of Area 51 was delegated from the AEC (DOE) to the Air Force in an agreement that is still secret. Here is DOE's current statement on Area 51 land withdrawals, in which "Area 51" is actually used and is confirmed as a former designation for the land. Nellis Air Force Base is only at the early stages of its EIS process but is moving ahead without delay. It is now conducting preliminary hearings in preparation for an end-of-the-century renewal deadline. This EIS will accompany the application to Congress for renewal of the Nellis Range. The Nellis range definitely includes Papoose Lake, Freedom Ridge, the Groom Mountain Range and all the land immediately surrounding the 6 x 10 mile block of land known as Area 51. As mentioned, it may also include Area 51 itself, but this is unclear. We first learned of the Nellis EIS process at a March 27 meeting of the Lincoln County Commissioners in Pioche, when an Air Force contingent appeared on the agenda. The visitors included Col. Jerry Carpenter, Commander of the 99th Range Group* at Nellis; Lt. Col. Ron Wallace, apparently also of the Range Group, and a contractor representative, Doug Bradford of SAIC (Science Applications International*) which is preparing the EIS. Col. Carpenter fills the position once held by Col. Bud Bennett before the 554th Range Group was combined with the 99th. Carpenter and crew addressed a nearly empty commission room to inform the county of the upcoming EIS process. Carpenter was pleasantly evasive, assuring the commissioners that they could trust him completely--within the constraints of what his superiors allowed him to do. We asked the obvious question about whether Groom Lake was included in the EIS. (Note: We asked about "Groom Lake," a dry lake bed that appears on maps, whereas "Area 51" does not officially exist under that term and would provoke a non response.) The otherwise talkative Carpenter became quiet then, and Col. Wallace responded. He would not reply directly, but said only that all lands withdrawn under Public Law #99-606 and amendments were included. "How can we comment on an EIS, if we don't know what lands it includes?" we said. Carpenter only repeated some generic lines about there being many things they couldn't talk about. Carpenter talked again about trust. We informed him that the essential key to trust was quality of refreshments at all their public meetings. In the midst of the cordial bureaucratic doubletalk, thought we thought we heard a subtle suggestion that the Air Force would not rule out further land acquisitions in the future. If so, we can only speculate about what lands might be at risk. Tikaboo Peak might be a possible target, but this would seem a foolish political action. If they tried to tack this onto the range renewal, it would become the news hook to guarantee massive publicity for their otherwise moribund EIS process. Another possibility is that the Air Force might seek control of Area 51 itself, officially taking over from DOE. The range renewal process is similar to the withdrawal process for Freedom Ridge except that a much larger land area is involved, a full-blown EIS is required, and Congress must specifically approve the withdrawal. The Air Force is asking for an indefinite renewal of the withdrawal, meaning there would be no further hearings in the 21st Century. This request may turn up the political heat on the Air Force in the current process. Here is the Notice of Intent from the Federal Register and a schedule for the Nellis EIS process. Nellis has been sending out newsletters to interested parties, and perhaps you can get on their list by contacting the Nellis Public Affairs Directorate at 702-652-2750. Next on the agenda is a series of public scoping meeting in June. At the "Neighborhood Dialogue" in Caliente, Air Force and SAIC personnel outnumbered local attendees four-to-one. On May 20, we dropped in on the Neighborhood Dialogue in Caliente and found it woefully lacking in the refreshments department, but there were plenty of freebies--posters, photos and patches--and a whole gaggle of Colonels with no one to talk to but little ol' Psychospy. There were about 20 in the entourage, including two full Colonels, four Lt. Colonels and an assortment of Majors, airman and SAIC employees to assemble the displays and operate the slide projector. The group had traveled here in a bus, and Caliente was the next-to-last stop in band's six-town tour. We think they could use a new manager, because only six guests turned up in this back-water bayou, and attendance never topped twenty in any of their previous gigs. Better hors d'oeuvres might have helped. With half the Air Force at our disposal, we chatted up the brass and asked about range operations. Everyone knew Psychospy, and a Colonel said he had visited our web site. The number "51" was never mentioned, of course--it's so gauche. There was a slide and video show about range operations and Col. Carpenter and Installation Commander Chris Long gave short speeches. This was followed by a question and answer period. We asked again whether Groom Lake was included in this EIS, and we got the same politely inconclusive answer: All lands covered by 99-606 and amendments would be included. Another citizen asked whether the federal government had any right to manage public lands to begin with, and Col. Chris Long said they were operating on that assumption. A third resident asked how long you had to be in military service to get a Majestic clearance. We smiled at that one, but no one else in the room seemed to get the joke. Col. Chris Long seemed genuinely stumped. He said he had not heard of such a clearance. Lacking further questions, the presentation ended, and we went back to chatting with the brass. In the interests of courtesy, we avoid the whole Majestic issue and tried to ask only non-threatening questions that could be answered. We did stumble across a couple of tidbits. One is the connection between Area 51 and Gulf Breeze, Florida: The 53rd Wing* at Eglin Air Force Base*, not far from Gulf Breeze, reports directly to Nellis Air Force Base under the Air Warfare Center. The mission of the 53rd is both mission training and the testing of new weapons systems. Presumably those activities will take place over the ocean just south of Gulf Breeze. The 79th Test and Evaluation Group* is also located at Eglin. This unit is allied with Edwards Air Force Base*, which may control Area 51. It seems only natural, then, that Gulf Breeze should be a UFO hotbed. Base Camp is used as a staging and support area for field personnel and as a recreation area for military and contractor personnel. Base Camp has a recently extended and improved airstrip, several buildings for sleeping quarters, shop and maintenance buildings, and a recreation building. Base Camp is manned by three to six people. Recreation area? This is not beachfront property. Base Camp is a gritty little grease spot that no personnel would care to visit if they weren't being paid to. The physical facility is hardly secret, being adjacent to a public highway, but the state-of-the-art telemetry and aggressive security there have always interested us. US-6 is so lightly traveled that any flying saucer landing there would hardly be noticed. The fact that the officer wouldn't talk about it confirms the conspiracy. The Special Nevada Report says Base Camp is associated with testing programs at Tonopah Test Range. The Air Force now talks freely about the existence of TTR, so we wonder why Basecamp can't be mentioned. We were pleased to find there was a new Public Relations Director at Nellis, Major Andrew Bourland. He seems a genuinely nice guy and a vast improvement over the previous flack, Major George Sillia. At last Nellis may be learning the art of P.R.! Just to meet these higher ups face-to-face has done much to restore our faith in the Air Force. We believe Col. Carpenter when he says we can trust him completely--within the limits of his orders. All rights reserved. May not be copied, reprinted or posted elsewhere without permission. This site is supported by our Mail Order Catalog and Readers Like You. Have you paid your Guiltware yet? Five bucks clears your conscience. All links should work and all information should be accurate. If you find otherwise, please report it. Include the page URL and enough information to let us fix the problem.